As discussed in the introduction, one of the main goals in establishing a reliable spectral-type scale is correlating the empirical sequence against the physical parameters which determine the overall energy distribution and detailed spectroscopic appearance of the very low-mass star or brown dwarf. While parameters such as gravity and chemical abundance probably play a significant role, the expectation is that the changing appearance of M, L and T dwarfs is driven primarily by changes in effective temperature. Thus, it is clear that the late-type M and L dwarfs which have been the main targets of the near-infrared sky surveys must have temperatures significantly lower than 3000K. 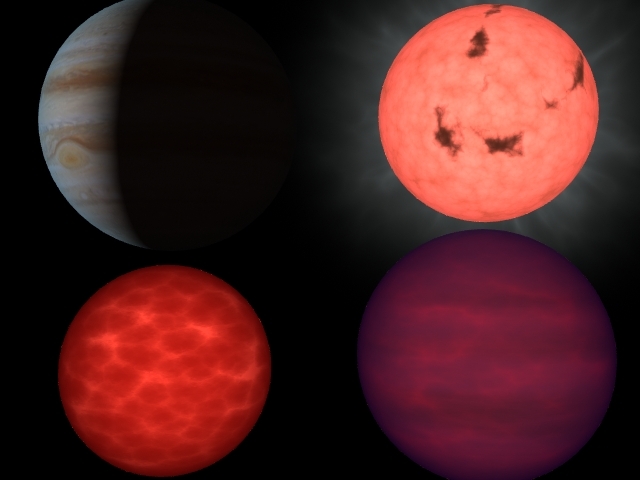 The following sections summarise some recent attempts to quantify the temperature scale for later type dwarfs. 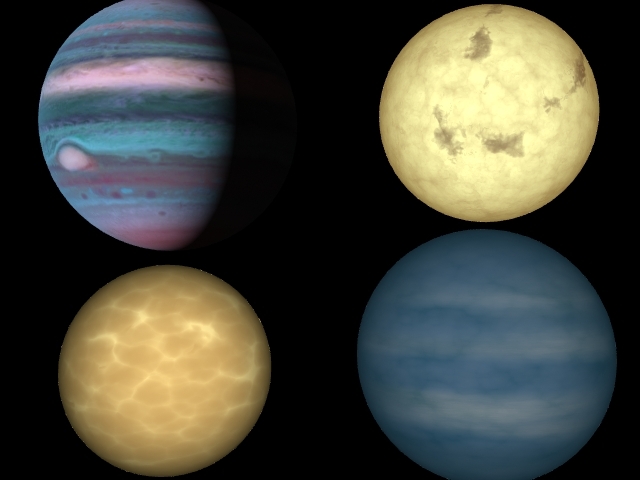 In principle, the most accurate method of determining the effective temperature of a stellar object should be through matching the spectral energy distribution against predictions based on theoretical models. In practice, the atmospheres of late-type M dwarfs and L dwarfs are rendered extremely comple by the presence of several important diatomic and triatomic molecules, notably TiO, VO and metal hydrides at optical wavelengths, and H2O in the near-infrared. Substantial progress has been made in this field over the last few years, with the various manifestations of the Phoenix models (see, for example, Hauschildt et al, 1997 & Allard et al, 2001) providing a dramtic improvement over the Mould (1976) models, which were still basically the only game in town in the early 1990s. However, accurate model atmosphere calculations require data for the hundreds of thousands of lines contributed by the more important molecules, and those linelists remain incomplete. This results in systematic deficiencies in the models: for example, one of the three transitions in the 7050 A. TiO bandhead is simply not present in the theoretical spectra predicted by state-of-the-art atmosphere models. Dealing quantitatively with the effects of dust formation offers another significant complication. In qualitative terms, dust grains start to for form at mid-M spectral types; the grains grwo in size with decreasing temperature, and eventually `rain out' to deeper layers below the effective photosphere. Until rain out is complete, however, the dust grains absorb short wavelength radiation and re-emit that energy at longer wavelengths (backwarming), with concomitant effects on the overall temperature structure. The resultant emergent spectrum, particularly at near-infrared wavelengths, depends strongly on where the grains reside within the atmosphere: dusty models for mid and late--type L dwarfs are 1-2 magnitudes redder in (J-K) than grain-free models. Spectral features are also dust dependent: as already noted, the relatively shallow depth of the near-IR steam bands, as compared with Mould's (1976) models, is a product of backwarming by dust (Tsuji et al, 1996). Clearly, these unavoidable complications should make one leary of placing overmuch reliance in quantitative conclusions derived from matching detailed observations against those same models. Even with these limitations, the current generation of models provide a reasonable representation of the spectral energy distribution of late-type dwarfs, and a much-improved match to observations of early- and mid-type M dwarfs. We can use the latter fact to extend the reference temperature calibration given by YY Gem and CM Dra. Leggett et al (1996) matched one of the first generation of Phoenix models (Allard & Hauschildt, 1995) against near-infrared spectra of M dwarfs, deriving temperatures between 3700 and 2700K. The coolest dwarf included in this analysis was GJ 1111, spectral type M6.5, with a deuced temperature of 2700K. This provides a reference point for the upper end of the ultracool dwarf temperature scale. Somewhat paradoxically, modelling T dwarf atmospheres is a much simpler prospect than dealing with the hotter and more luminous late-M and L dwarfs. Many of the more important opacity sources have precipitated out as dust and therefore do not need to be included in the calculations. Moreover, observations indicate that the grains themselves have rained out to relatively deep layers within the atmosphere, Thus, Noll et al (1997) have used the models computed by Marley et al (1997) to analyse the detailed photometric and spectroscopic observations of the T6 dwarf, Gl 229B, deriving a temperature estimate of 950+/-50 K. This sets a reference point at the lower end of the ultracool dwarf temperature scale. Figure L4.1: Spectroscopic temperature scales: the magenta squares plot the temperature calibration derived by Basri et al (2000); the yellow points plot results from Schweietzer et al (2001, 2002). The cyan points mark the reference points provided by GJ 1111 (M6.5) and Gl 229b (T6). The spectral types are on the K99/Burgasser et al. (2002) scale. Basri et al (2000) used a later generation of Phoenix models to analyse high-resolution spectra of late-type M and L dwarfs, matching the line profiles of the neutral caesium and rubidium resonance lines. Figure L4.1 plots their results as a function of spectral type. In brief, they place the M/L transition at 2200-2300 K, while L8 dwarfs, such as 2MASS1632+19, are assigned temperatures of 1600-1700K. Martin's spectral types are tied to this temperature scale. More recently, Schweitzer and collaborators have analysed both high-resolution and low-resolution spectra of late-tyep M and L dwarfs. The high-resolution analyses (outlined in Schweitzer et al, 2001) are similar in nature to the Basri et al study, deriving temperature estimates based on detailed modelling of line profiles. The temperatures derived from those analyses show little variation with spectral type - essentially all of the dwarfs, spanning spectral types M9.5 to l3.5, have Teff = 2000+/-100 K, with no obvious correlation with spectral type. In contrast, matching lower-resolution (Keck LRIS) data against the models produced the temperature/spectral-type correlation plotted in Figure L4.1 - temperatures typically 100K lower than the Basri et al scale. Follow-up analysis of LRIS data for other L dwarfs (Schweitzer et al, 2002) extends this calibration to spectral types L6-L8, which are assigned temperatures between 1700 and 1400K. Before the availability of even reasonably accurate model atmospheres, most estimates of the M dwarf temperature scale rested on the analysis of broadband photometry. One widely-used technique, originating with Greenstein, Neugebauer & Becklin (1969), was blackbody fitting - fitting a Planck curve to the spectral energy distribution outlined by broadband data, and equalising the area under the two curves. Usually the Planck curve is normalised to the flux at either K or L. This technique has been used by Reid & Gilmore (1984), Berriman & Reid (1987), Berriman et al (1991) and Tinney et al. (1993). In many cases the broadband data are supplemented by either CVF spectrophotometry or near-infrared spectroscopy. The temperature scale derived from these analyses places spectral type M9/M9.5 at 2000-2100K. Figure L4.2 shows the results derived by Tinney et al. for the coolest dwarfs in their sample (including GD 165B). More recently, Stephens et al (2001) have used a hybrid approach, comparing (K-L) colours against theoretical predictions to derive a spectral type relation Teff = 2220 - 100 * n where n is the spectral type, Ln, n=0 to 8. Figure L4.2: Photometric temperature scales: blue open circles plot data from Tinney et al. (1993); the magenta squares plot the temperature calibration outlined above; the yellow line plots the calibration deduced by Stephens et al (2001). As in L4.2, the cyan points mark the reference points provided by GJ 1111 (M6.5) and Gl 229b (T6). As an alternative to these techniques, if the bolometric magnitudes are known and the radius can be estimated, we can use the fundamental equation given above to derive effective temperatures. Both Kithpatrick et al (1999) and Reid et al (1999) point out that since the radii of these cool dwarfs is largely set by degeneracy, most of the difference in luminosity can be ascribed to differences in temperature. Moreover, the bolometric corrections for these dwarfs appear to be well-defined, with relatively little variation in BCJ in particular over the full range between mid-M and T (Leggett et al, 2000; Reid et al, 2001).Thus, it is not only relatively straightforward to transform the observed near-infrared magnitudes to bolometric luminosities, and hence estimate temperatures, but the small magnitude difference at MJ between 2M1523+30 (Gl 584C, L8, one of the lowest luminosity L dwarfs) and Gl 229B, the archetype of class T, suggests strongly that there is a relatively small temperature difference between those two dwarfs. That, in turn, suggests that there is relatively little scope for as-yet undiscovered classes of brown dwarfs between the latest-type L dwarfs in the current observational samples and the `transitional' early-type T dwarfs discovered by the Sloan Digital Sky Survey. GJ 1111, M6.5, Teff=2700 K, Mbol=12.39, R = 0.131 RSun (we take TSun = 5780K). Dahn et al. (2002) have devised a relation between bolometric magnitude and Mbol based on the 1- and 5-Gyr evolutionary models computed by the Lyon group (Chabrier et al, 2000) and the Arizona group (Burrows et al, 1997). That relation underestimates both of the above radii by ~10%, so we recast it as R/RSun = 0.097 + 0.00077(16.2 - Mbol)2.9, Mbol < 16.2 and R/RSun = 0.097 - 0.00077( Mbol - 16.2)2.9, Mbol > 16.2 Figure L4.2 shows the resulting temperature scale - broadly consistent with both the Stephen's et al calibration and the Schweitzer et al low-resolution spectroscopic scale between M88 and ~L6, but favouring lower temperatures at later types. Indeed, the L8 dwarfs in this calibration effectively overlap in temperature (at 1200-1300K) with the early-type T dwarfs, such as SDSS1254. One of the important points to bear in mind in studying ultracool dwarfs is that these spectral types encompass a mix of very low-mass stars and brown dwarfs. Unlike hydrogen-burning stars, where the location on the main sequence changes very little over the star's lifetime, brown dwarfs evolve on relatively short astronomical timescales. They emerge from the T Tauri stage with temperatures of ~3000K, equivalent to mid-type M dwarfs, but cool rapidly through mid- and late-M, before descending through class L to become T dwarfs (and, in principle, whatever comes next). Burrows & Liebert (1993) give approximate analytic relations for this behaviour: Teff ~ 27,700 t -0.324 M 0.827 (where we ignore a weak dependence on the Rosseland mean opacity) and L ~ 1.74 x 10-6 t -1.297 M 2.04 kR0.35 Thus, the higher the mass, the slower the cooling and consequent decrease in luminosity. Figure L4.4: An artist's impression of the visual appearance of a late-M, L- and T-dwarfs. The M8 dwarf, plotted in the upper right, is scaled to a temperatures of ~2500K, with the dark areas representing active spots; the L5 dwarf, plotted in the lower left, represents a MSun brown dwarf at age Y Gyrs, T= yyyyK, with the cross-hatched structure outlining large convective cells; the T dwarf is set to match a yy Msun object at age Y Gyrs, T= , and is starting to show the belts and zones which characterise Jovian planets. An image of Jupiter is shown in the upper left to give the size scale: the T dwarf has a simialr radius; the M8 and L5 dwarfs are approximately 10% smaller. A further feature of low-mass dwarfs is that, to first order, they all have the same radius - more exactly, for masses below ~0.09 MSun, all isolated dwarfs, whether hydrogen-burning or not, have masses within 10% of that of Jupiter. This behaviour stems from the fact that these low mass dwarfs are partially electron degenerate - just as in white dwarfs, the radius is set by degeneracy pressure rather than hydrostatic equilibrium. The larger radius (Jovian rather than terrestrial) reflects the different mean molecular weight, me, since R ~ M-1/3 me-5/3 for electron-degenerate polytropes. Figure L4.4: The same four dwarfs at near-infrared wavelengths: the methane bands lead to the "blue" colour of the T dwarf. Figure L4.5: The theoretical HR diagram for low-mass stars and brown dwarfs. The model calculations are from the Arizona set (Burrows et al, 1997). Dotted lines plot evolutionary tracks for individual masses: 0.015 MSun (yellow), 0.020 MSun (cyan), 0.03 MSun (magenta), 0.040 MSun (green), 0.050 MSun (red), 0.060 MSun (blue), 0.075 MSun (yellow), 0.080 MSun (magenta), 0.090 MSun (green) and 0.10 MSun (red). Note that low mass brown dwarfs are more luminous at a given temperature due to their larger radii. The corresponding isochrones for ages 106 to 1010 years are picked out by the appropriate symbols, connected by solid lines. The two large stars mark the locations of GJ 1111 and Gl 229B. The resulting implications for the HR diagram are illustrated in Figure L4.5, which plots evolutionary tracks from the Arizona models (Burrows et al, 1997) for a range of masses between 0.015 and 0.10 MSun. With only a limited range of radii, brown dwarfs (and even low-mass stars) of different masses follow very similar tracks in the (Mbol, Teff) plane. Thus, even when one has an accurate parallax, luminosity and temperature, it is generally possible to estimate a mass for a brown dwarf only if there is some independent estimate of the age. (There is a caveat - see below. ) It is for this reason that wide companions of main sequence stars (such as 2M1523+30 = Gl 584C, 2M1112+35 = Gl 417B, Gl 570D and Gl 229B) and confirmed members of open clusters, where independent age estimates are possible, provide a powerful means of testing theoretical models. Figure L4.6: The evolution of central temperature with time in the Arizona models of low-mass dwarfs. The numbers indicate the masses in solar units. These models predict a hydrogen-burning limit of ~0.075 MSun; note that at that mass, H-burning lasts for only ~10 Gyrs. The lithium burning limit is ~2 x 106K. The caveat mentioned above regarding mass estimates centres on whether lithium absorption is detectable in the spectrum of an ultracool dwarfs - although even here, one obtains an upper (or lower) limit to the mass, rather a direct estimate of the mass of an individual object. Figure L4.6 shows the physical basis for what has become known as the "lithium brown dwarf test" (Rebolo et al, 1993). As the protstellar core collapses, the central temperature increases. Hydrogen fusion reactions are initiated when that temperature exceeds ~3 x 106K, and if those persist, the dwarf evolves onto the main sequence as a (very) long-lived ultrcool dwarf. However, those reactions can be damped out as energy is depleted (and the central temperature drops) through increasing degeneracy. Thus, a 0.075 MSun dwarf in the Arizona models is able to maintain quasi-stable hydrogen fusion for ~10 Gyrs before dropping into the brown dwarf regime. At lower masses, the central temperature is never able to maintain sustained hydrogen fusion, and the brown dwarf `cools like a rock'. Figure L4.7: Lithium destruction in the PP chain. 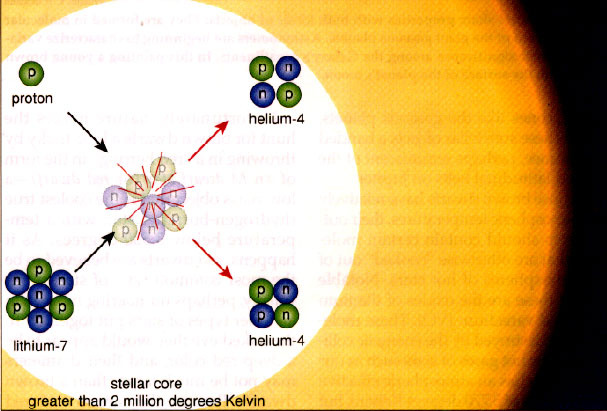 Low mass stars are powered by hydrogen fusion in the proton-proton chain (which terminates at the formation of He3, rather than He4, in stars with masses below 0.025 M<>Sun). However, another important reaction involves lithium, which combines with a proton to form two He4 atoms (Figure L4.7). That reaction requires a temperature of T > Tcrit ~ 2 x 106K. It is clear from Figure L4.6 that a 0.06 MSun brown dwarf barely achieves this threshold, while lower-mass brown dwarfs fall far short. Figure L4.8: Lithium depletion and survival in low mass dwarfs. Lithium is produced in limited quantities by the PP chain (at least in higher-mass M dwarfs), but it is also a Big Bang nucleosynthetic product. Thus, every star and brown dwarf starts its life with a baseline abundance of lithium. If that dwarf has a mass below ~0.30 solar masses, it is fully convective; that is, convection transports material from the surface to the hydrogen-burning core. Thus, all of the material is exposed to the maximum range of temperature. The net result is that the primordial lithium (and any PP chain products) is destroyed rapidly in dwarfs with M > Mcrit, where Mcrit ~ 0.06 Msun. Note that stars with masses above ~1 MSun also retain primordial lithium, since the outer convective shell is sufficiently thin in those stars that the material is never exposed to temperatures above Tcrit. Figure L4.9: lithium depletion as a function of time and temperature. The upper panel plots evolutionary tracks from the Arizona models for dwarfs with masses between 0.015 and 0.11 Msun; the lower panel plots similar data for the Lyon models. The boundaries between spectral types M, L and T are shown, and the solid yellow line marks the locus where lithium is predicted to be depleted to <1% of its primordial abundance. Lithium persists in dwarfs with M > Mcrit for a relatively short, but still significant, period of time. 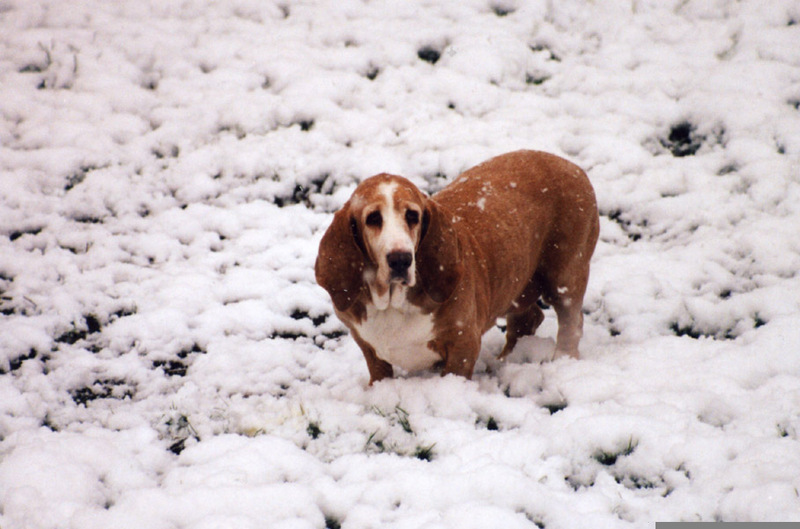 Not surprisingly, the depletion rate depends on the central temperature, and hence the mass. Thus, higher-mass brown dwarfs (and even hydrogen-burning stars, vide T Tauris) can have measureable lithium. However, Figure L4.9 shows that the models predict that any dwarf with detectable lithium and a spectral type later than M6 should be a low-mass brown dwarf: for more massive dwarfs, the cooling time to reach that temperature (~2800K) is sufficiently long that all of the primordial lithium should be depleted. Figure L4.10: Lithium in late-M and L dwarfs ,br> 2M1439 are spectral type L1; 2M1146 is spectral type L3; Denis 1228 is L5; and 2M0850 is L6. The last mentioned is known to be an unequal-mass binary. Lithium has a relatively strong resonance doublet at 6708 A (whose visibility is enhanced in L dwarfs by the transparent atmospheres), so both low-mass brown dwarfs and young higher-mass dwarfs can be identified directly. Figure L4.10 plots some examples of ultracool dwarfs with detected lithium; other examples are present amongst the dwarfs plotted in on the spectroscopic classification page.